This ribbon cutting scissors stand provides a throne for your special scissors on stage. The sturdy metal frame has an adjustable height ranging from 27 inches to 40 inches to accommodate various scissors sizes. A convenient neck guard is built in to keep the scissors locked in an upright position. 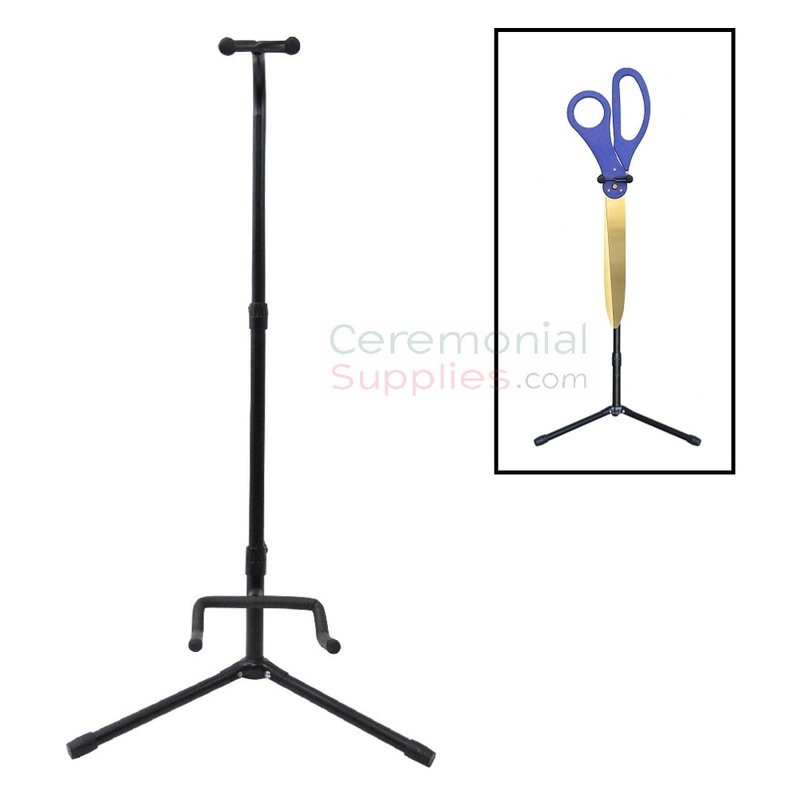 This Ribbon Cutting Scissors Stand is perfect for a Grand Opening Ceremony. Everyone thinks about the main event of actually cutting the ribbon, but important details are often overlooked, such as where to place the scissors beforehand or afterward. Having a Scissors stand not only provides this answer but also allows for a great photo opportunity to display this important tool of this event. It provides a pedestal for guests to take photos and admire. Ceremonial scissors play a special role in a Grand Opening or Ribbon Cutting Ceremony; they deserve a special place on the ceremonial event's stage. This scissor stand is a convenient way to display the giant scissors while also keeping up with the grandness of the ceremony. 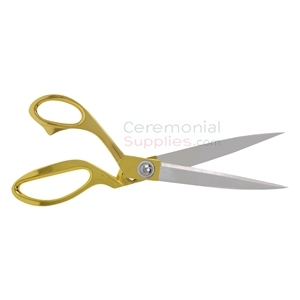 These regular sized scissors are a great alternative to the usual oversized pair; with their stainless steel golden colored handles, they ensure that you do not lose the ornamental factor. The stainless steel blades and a traditional grip makes sure ribbon-cutting remains a breeze. The blades measure 4.2 inches, with the overall size being 10.5 inches. Stylish Green Ribbon Cutting Scissors with and stainless steel blades. Available in 25 inches or 30 inches in length. Customization option available on blades. Turn your newly purchased ornate ceremonial accessories into mementos post-ceremony with this display case! 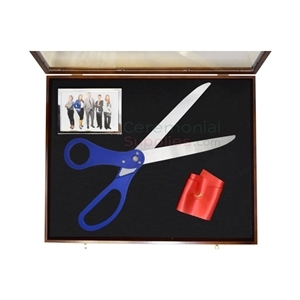 Designed to fit 25 inch scissors and a photo frame to accommodate a picture of the event, the display case measures 25 inches in width, 16 inches in height, and 2 inches when it comes to depth to ensure ample space. Purchase a mini scissor pin to decorate a piece of the ribbon used in the ceremony to preserve along with the scissors. Allow 5-6 business days for processing. Sissors sold separately.